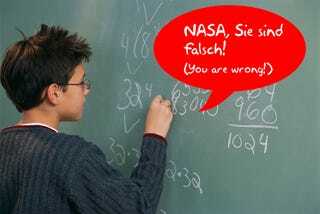 NASA has been forced to check its math after a 13-year-old German boy wrote to tell them their calculations for the probability of an asteroid hitting earth were incorrect. Agency bosses had predicted a one-in-45,000 chance of an interstellar object bringing an end to life as we know it; that was until teen Nico Marquardt told them that the figure was closer to one in 450. The asteroid in question is the Apophosis. If it runs into one or more of the earth's 40,000 satellites as its path brings it closest to our planet on April 13, 2029, the collision could be enough to alter its trajectory and send a 200-billion-ton ball of iron and iridium our way in 2036. The impact would be followed by tsunamis that would destroy coastal and inland areas around the Atlantic Ocean. To top this disaster-movie situation off, a thick layer of dust would blanket the Earth.